Some electric pressure washers must be plugged directly into an outlet. This means you would not be able to use an extension cord, so your reach would be limited. When the weather's nice, it's great to get outside and enjoy your yard, your grill, and your deck. But getting these outdoor fixtures into a pristine condition that mirrors the beauty of nature can seem like an unattainable goal. However, if you have an electric pressure washer, that changes everything. An electric pressure washer is a cost-effective, quiet-running solution to your outdoor cleaning needs. It is easy to operate, requires minimal maintenance, and can provide some impressive results. After reading this brief guide, you'll have the information you need to choose the electric pressure washer that is best for you. Although there can be a bevy of features and attachments that accompany an electric pressure washer, there are two you should look at very closely, as they provide the most accurate assessment of the unit's cleaning ability. These features are the product's PSI (pounds per square inch) and GPM (gallons per minute). The PSI of a pressure washer tells you how much water force the machine can generate to knock loose dirt and grime. Electric pressure washers range from under 300 PSI to as high as 1,900 PSI. A higher PSI means more potential cleaning power, but that is only half of the equation. The other half of the equation is the pressure washer's GPM. This tells you how much water is available to carry away the dirt and grime. If you think this isn't as important, imagine trying to take a shower with just a trickle of water. Electric pressure washers range between about 0.5 GPM and 1.8 GPM. If you multiply PSI by GPM, you'll get your electric pressure washer's CU (cleaning units). The higher this number is, the greater your model's overall cleaning power. There are a few other features to consider besides PSI and GPM. Following are the most important ones. Nozzles: Ultimately, the nozzles are what designate your pressure. The wider the variety of nozzles a product has, the more cleaning flexibility you will have. Additional attachments: This can range from surface brushes that allow you to better clean your deck to special wands that allow you to clean the second story of your home. Keep in mind that some special attachments will need to be purchased separately. Mobility: The unit's hose length and power cord length are crucial when it comes to mobility. If you can't reach it, you can't clean it. Price: The price of an electric pressure washer correlates with its CU. If you desire higher PSI and higher GPM, you'll pay more for it. Low-end electric pressure washers can cost as little as $80, but you'll want to look in the $150 range for better build quality. High-end electric pressure washers can cost as much as $300. Q. Can I use soap with my electric pressure washer? A. Yes. Specially formulated detergents can be used with most electric pressure washers. However, you must always be very careful when adding anything other than cold water to your equipment. Bleach, for instance, can and will damage your unit's seals and other sensitive parts. The best solution is to thoroughly read your owner's manual to learn which cleaning solutions are safe to use with your electric pressure washer. Q. Are there any safety tips I need to keep in mind when using an electric pressure washer? A. Yes! For starters, only use your equipment while standing on a stable surface (never a ladder). Wear ear and eye protection. Never aim the pressure washer at any living thing (human, animal, or plant). Avoid spraying in the direction of power lines and electrical fixtures, too. And never leave a powered pressure washer unattended. 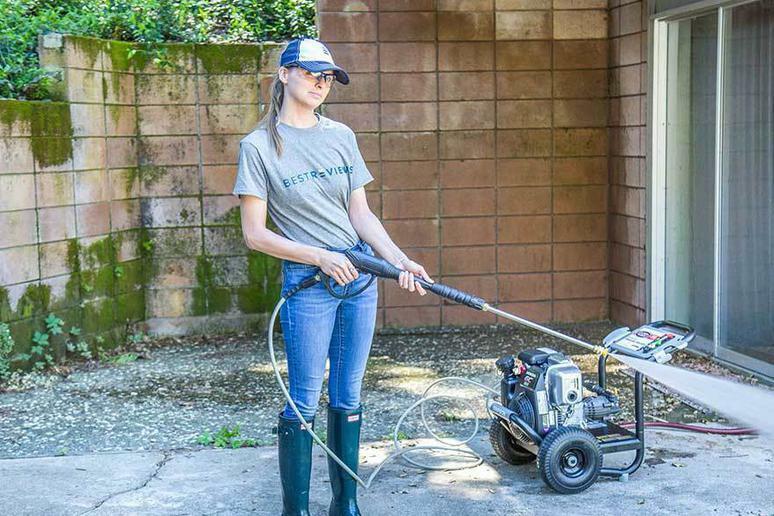 Our take: This powerful electric pressure washer can tackle some of the tougher jobs that are typically reserved for gas pressure washers. What we like: The water-cooled design helps prolong the life of the unit. The pressurized hose reel makes for easy storage. The manufacturer includes two cleaning wands for a variety of chores. What we dislike: Some of the parts are not industry-standard design, which can make them harder to locate and more expensive to replace. Our take: A cost-effective electric pressure washer that can handle a variety of light-duty cleaning tasks. What we like: This model includes an impressive number of accessories, ranging from five different quick-connect spray tips to a convenient needle clean-out tool. The dual detergent tanks and safety lock switch are handy features. What we dislike: Great care must be taken, especially when storing, to be certain your electric pressure washer gets the maximum lifespan. Our take: An affordable and versatile light-duty cleaning tool that is easy to use. What we like: The unit is powered by a rechargeable battery and can be used for watering and light cleaning tasks. The included scrub brush and window squeegee can help you accomplish a variety of chores. What we dislike: The fact that it's powered by battery makes it portable, but the charge may not be enough for longer work sessions.